What do Ratatouille, Filet Mignon, and Le Foie Gras all have in common? These French dishes are all something you might find on the menu at a five-star restaurant. French cooking has heavily influenced the meals we eat, but to prepare these dishes properly requires a lot of talent in the kitchen. We’ve become accustomed to associating French terminology with fine dining, so when you hear the term “Sous Vide”, it’s easy to brush it off as a cooking method reserved for the culinary elite. In reality, it is quite the opposite. Sous Vide is a term which translates to under vaccum. This cooking technique is incredibly easy to use, allowing even complete amateurs to prepare perfectly cooked meals with ease. This cooking style has been used by high end restaurants for years, but only with expensive hardware that is designed to prepare huge quantities of food. Recently, a number of consumer friendly models have hit the market. Using them is simple. You place the cooker on the side of a pot filled with water. You place your food (generally a cut of meat) in a sealed bag at attach it to the cooker. You can then set the exact cooking temperature, and a water heater heats the water and circulates it throughout the pot. This cooking method is a great way to prepare food that can dry out, or food that needs to be tenderized. Because it’s sealed in a bag, it cannot lose any moisture. You can leave it on for hours, without worrying about over cooking it. It is quite literally a set and forget system. For many, this cooking method is a game changer. But not all of these precision cookers are created alike. There are several differences between models, with each coming with their own sets of pros and cons. We’ll be taking a look at the three best Sous Vide Precision Cookers on the market. First, we’ll be taking a look at the most popular immersion cooker available. Even if you’ve never used on before, our in-depth review will help you understand how it works, and what it can do. After, we’ll take a look at the most popular alternatives, and help you decide which model is best for you. If you’ve just started your hunt for a precision cooker, this is likely the first model you will come across. 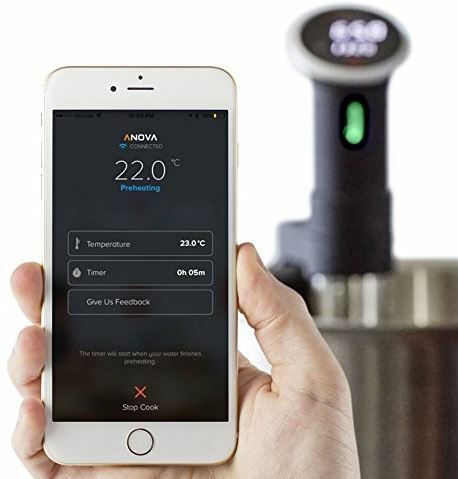 Anova is definitely one of the most prominent manufacturers on the market, with their precision cooker taking on a role as the poster child for the entire consumer sous vide industry. 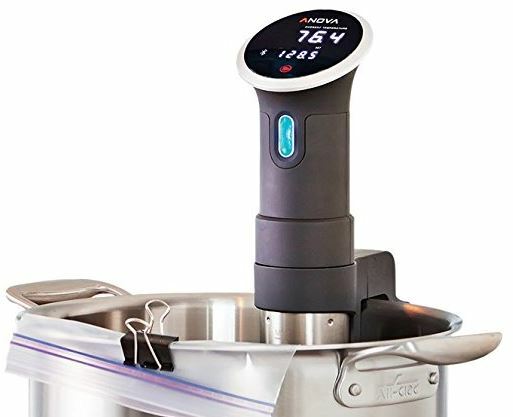 The Second Generation Anova Sous Vide Precision Cooker, although visually similar to the old model, adds a few key features. Most notably is the WiFi and Bluetooth connectivity. Just like many other smart devices, you can control it right from the palm of your hand. Other core components such as the element and the clamp have been improved, allowing it to work a little better than the previous model. Although it doesn’t affect the functionality, an enjoyable unboxing experience is always something we appreciate. Anova created a very stylish and well-made box. Simply lifting the flap exposes the cooker itself, and reveals a handy “quick start” guide. The guide and instruction manuals are easy to follow, and intelligently laid out. Since this cooking method will be new to many buyers, having clear instructions is essential. Removing the cylindrical cooker from the box, you might find that looks a little odd at first. Its definitely very different from any other appliance in your kitchen. But it’s actually quite simple in design. There are three main components. On the bottom half, you’ll see the element. The heater and the water pump (the parts that actually do the cooking) are tucked away behind the stainless steel skirt. All that you see are the slots where hot water is pumped out of the cooker. On the top, you’ve got the controls. Behind the seemingly blank face is an LCD display, and the silver bezel that runs around it is actually a rubber dial that can be used to set the temperature. 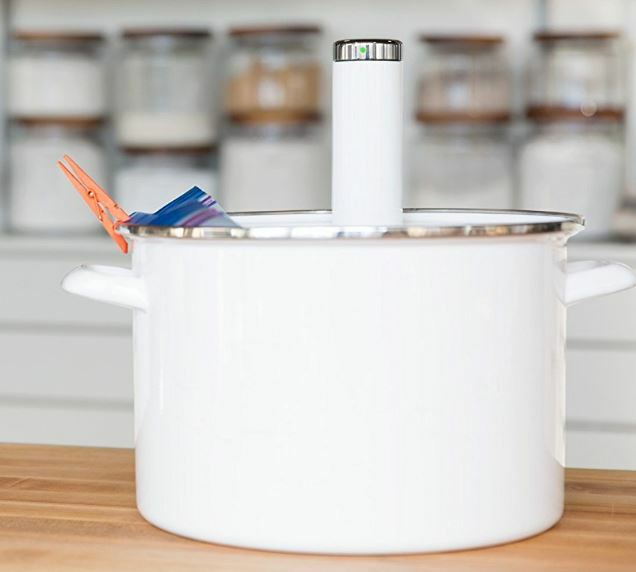 In the center, you’ve got the clamp that attaches the cooker to your pot. There are two dials. The smaller one allows the cooker to slide up or down the plastic ring, setting the depth in your pot. It has a total range of 3.5 inches, allowing you to use a variety of pot sizes and water levels. The large dial below it physically pushes the rubber-tipped screw against the side of your pot, holding the cooker firmly in place. Despite only having two points of contact, it is extremely stable. This clamp is one of the best in the industry, so you don’t have to worry about it slipping or moving while in use. Once you’re familiar with the layout, whipping up a meal is simple. The first thing you do is prepare your food. You can use the Anova precision cooker with vegetables, although it’s most commonly used for meat. You can prep your food and vacuum seal it yourself, or you can simply throw it into a ziplock bag. Vacuum sealing isn’t a requirement. As long as you push the air out of the resalable bag (so that it doesn’t float) you’ll have good results. Next, you’ll add some water to your pot. Using hot tap water will speed up the process a little, but you do not want it to be boiling. Add just enough water to fully immerse the bag containing your food. You can add more if you like, but this will slow down the heating process. Next, plug in the Anova and set your cooking temperature. You do this by simply turning the dial on the front until you see your temperature on the large LCD display. Once you let go of the dial, you’ll hear the Anova beep, and you’ll see the water start to circulate. We were amazed at how quiet it is. There is a slight hum in the background, but if we weren’t specifically listening for it we never would have noticed. You can now insert your food. If you used a ziplock bag like us, you might occasionally find that it tries to float to the top. This is most common with vegetables, or any situation where you’ve got a lot of air gaps between individual pieces. Here, just take a plastic spatula or a small plate and hold the bag under water for a moment or two. The air bubbles will float to the top, and the bag will stay down. Looking at the display, you’ll see two numbers. On the bottom is your set point – the temperature the Anova is aiming for. On the top, you’ll see the actual temperature of the water. As a precision cooker, you can guess that this number is pretty precise. It’s accurate down to tenth of a degree. If you have your water up to temperature and you add your food into the pot, you’ll see the temp drop quite quickly. This is nothing to worry about. As your food absorbs the heat, the actual temperature will quickly approach the setpoint. 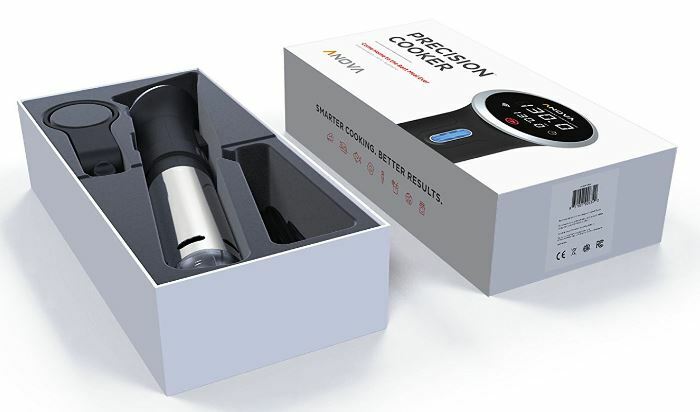 We found that Anovas Precision Cooker was a bit like a modern twist on a slow cooker. It’s very precise, but it’s not very fast. 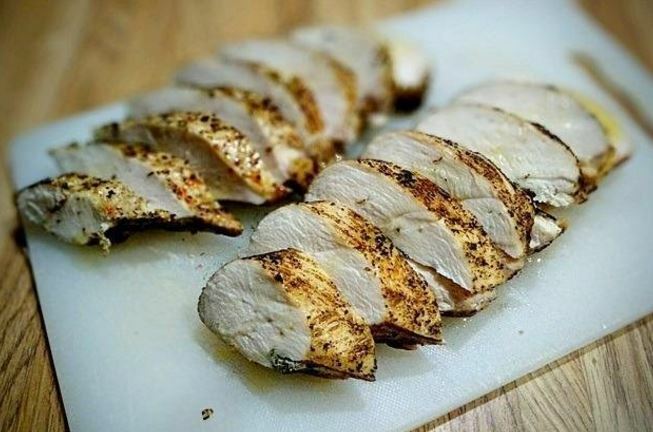 Some of the quickest meals (such as fish or thinly sliced chicken) can be prepared in less than an hour. For most common meats, you can expect 1 to 3 hour cook times. However, this isn’t all that bad. It takes a little pre-planning, but throwing your dinner on only takes a few minutes. Since the Anova cannot overcook your food, you can leave it on all day while you’re at work and come home to a ready to eat meal. For us, this was one of the biggest advantages of this cooker over another. 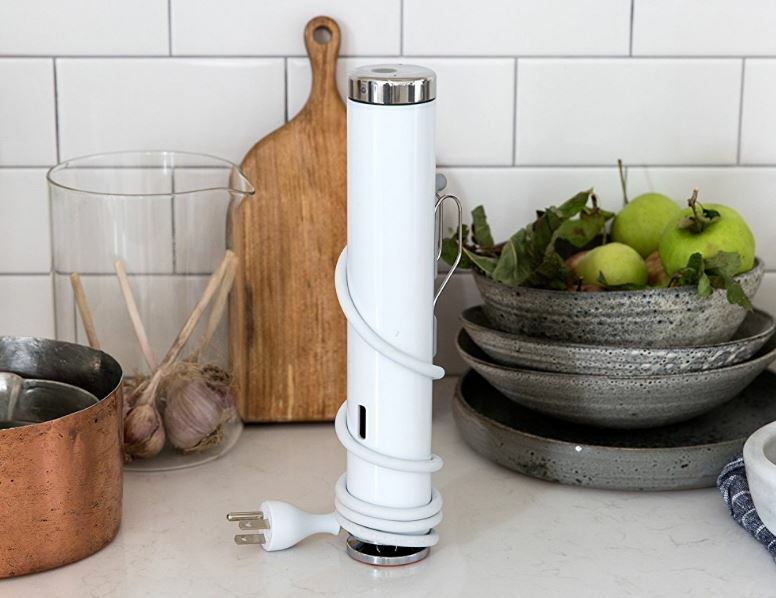 It connects through both WiFi and Bluetooth, and uses an app on your phone as the interface for the cooker. But this isn’t a simple remote control app. It’s more like a digital kitchen in the palm of your hand. We mentioned earlier that different foods require very specific temperatures, and that cook times can vary. If you’re not used to this style of cooking, it’s very hard to know what temperature to choose, and how long to cook for. The app is basically a recipe book in the palm of your hand. If you’re not sure what you make, you can browse the recipes for inspiration. If you’ve already got your own idea on the go, you can look up standard cook times for different types of food. Once you’re on the recipe, you can quickly tap the temperature and time buttons to start the cooking process. The WiFi model will connect to your home network, so you’ll still be able to send commands even when you’re out of the house. For some, the ability to start dinner while you’re on your lunch break will be a huge asset. It’s also nice to be able to get alerts on your phone when your food is ready. But in our eyes, this isn’t the most valuable part of the system. It’s the recipes and guides that makes it worthwhile. There is no learning curve. You simply look up the recipe online, throw it together, and automatically set the cooker appropriately. You can follow a recipe step by step, allowing the guided cooking system to help you along. You’re also able to customize the recipe. Prefer your steak rare? Just tape one button, and the settings will automatically be updated. Now that we’ve got a general overview of how the Anova Precision Cooker works, it’s important to understand the specifications. It’s important to go beyond the numbers, and understand how this affects its use in the real world. The heating element runs at 900 watts. Compared to other models, this is fairly average. The more power you have, the faster the water heats up. This depends heavily on how much water you have in the pot. The more water there is, the longer it takes. In our tests, it took an average of 20 to 30 minutes to heat up enough water to cook a typical meal for two. The pump can move 1.2 gallons of water per minute. This is important for heating up larger quantities of water, and allows for a maximum volume of 19 liters. We found that anything above 15 liters took quite some time to heat up, so we wouldn’t recommend going over this volume. The Anova Sous Vide Precision Cooker is one of the most popular options on the market, but it’s certainly not the only option. Depending on your needs, we selected two more models that may be a better fit. Anova’s top-tier model might be one of the best selling options, but it’s not suitable for everyone. If you’re finding our choices a little too pricey for your taste, this simplified Bluetooth model is a great alternative. All of the core features are the same as the high end WiFi Anova. The appearance, the controls, the water capacity, and the app remain unchanged. There are, however, two key differences. First, WiFi has been removed leaving only Bluetooth. You can still access all of the smart features and use the app, but you must be within 50 feet of your cooker to change any settings. If you’re already in the kitchen, this probably isn’t a big deal. The next change is the heating element. Instead of the 900 watt heater in the high end model, this one has an 800 watt heater. The end result is that it warms the water about 10% slower. For smaller meals, this won’t make much of a difference. 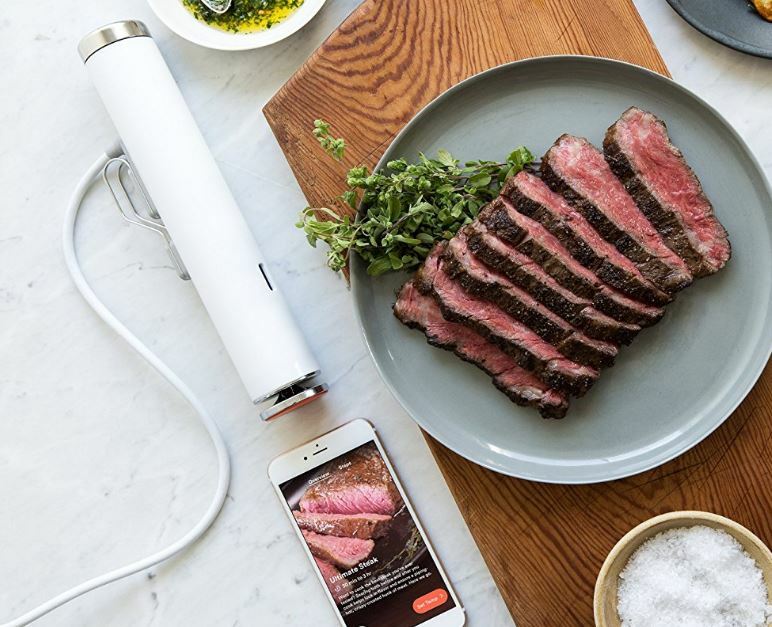 After Anova dominated the Sous Vide market, dozens of competitors came out of the woodwork to try and grab a slice of the pie. But these are not simple devices, and there weren’t many options that offered improvements over the existing models. 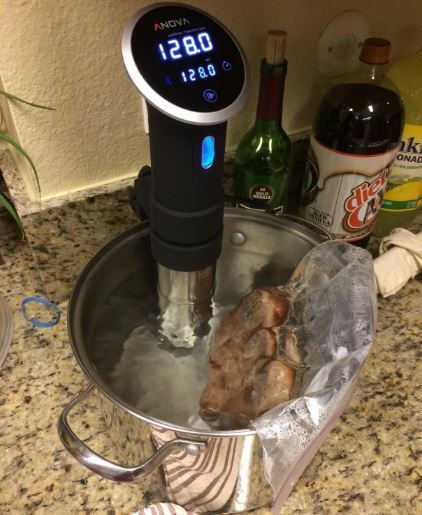 ChefSteps didn’t rush their precision cooker to market. Although they’re the new kid on the block, their impressive hardware really stood out from the crowd. For many buyers, the appearance of the ChefSteps CS10001 Joule Sous Vide is going to be the main selling point. There is no debate – it’s the most attractive looking one on the market. This is obvious the first time you see a photo of it. But there is one thing that a photo can’t accurately capture – it’s size. At only 11 inches tall, this cooker is surprisingly compact. Speaking in terms of volume, it occupies half the space of the Anova. You could easily store it in a drawer, freeing up valuable counter space. ChefSteps created a lot more than just a pretty face. The chromed cap on the top doubles as a button to turn it on or off, and a hidden LED on the side indicates power and current status. Red shows that it’s on and heating, green shows that the water is at the desired temperature. Since all sous vide precision cookers share the same basic fundamentals, the cooking process is generally the same. You still prep your food, put it in a bag, and submerge it in water. But there are a few key differences with this model that make it really stand out. The most obvious is the mount. Instead of a clip, the base is a magnet. Instead of clipping onto the side of your put, you just stick it right in the middle. Water gets sucked up through the bottom, and comes out in the center. There are two main advantages to this design. First, you can use any size pot or pan you like. Secondly, there is no minimum water level. You can get by with just half an inch of water if you like. As long as you cover your food, you’re good to go. Less water to heat means faster cook times, making this an efficient choice. This isn’t just another precision cooker with Bluetooth, this model works exclusively off Bluetooth. There are no controls other than an on / off button. All settings must be configured through your phone. You download the Joule app from the app store, and register a ChefSteps account. After briefly pairing the cooker, you’re given two options. You can set the temperature and timer manually, or choose from one of the recipes. Like Anova, the recipes are very adaptable. You can pick from basic foods to get cooking info, or follow along with one of hundreds of different video recipes. We found the interface to be a little nicer than Anovas, making it a great choice for beginners. On paper, the Joule looks to be a little better than some of the competing options. It’s got an 1100 watt heating elements, and supports up to 20 liters of water at a time. In the real world, the additional power doesn’t make a huge difference. In identical conditions, an 1100 watt heater can warm up water 20% faster than a 900 watt model. However, it doesn’t move the water quite as fast as the Anova. The Joule will heat up water faster than the Anova, but the power rating really has nothing to do with it. If you want to see a significant improvement, you just want to use less water. You can use a smaller pot with just enough water to cover all of your food, and get it warmed up in half the time. 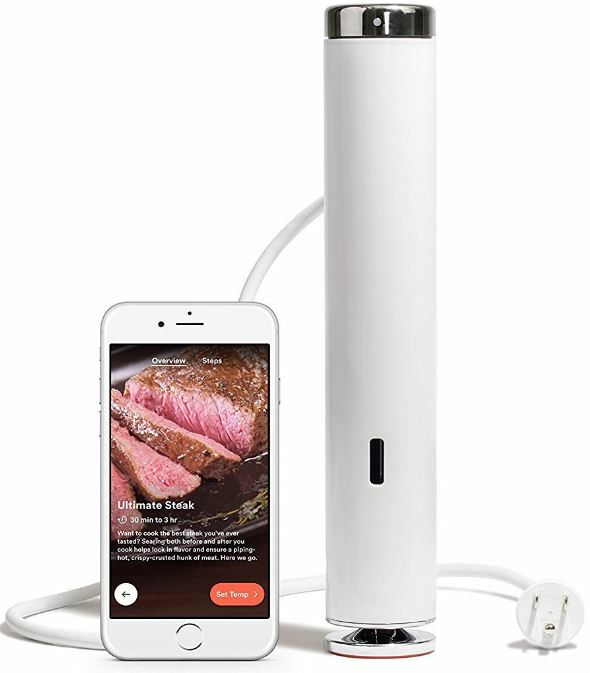 Which Bluetooth & WiFi Sous Vide Precision Cooker is Right for Me? 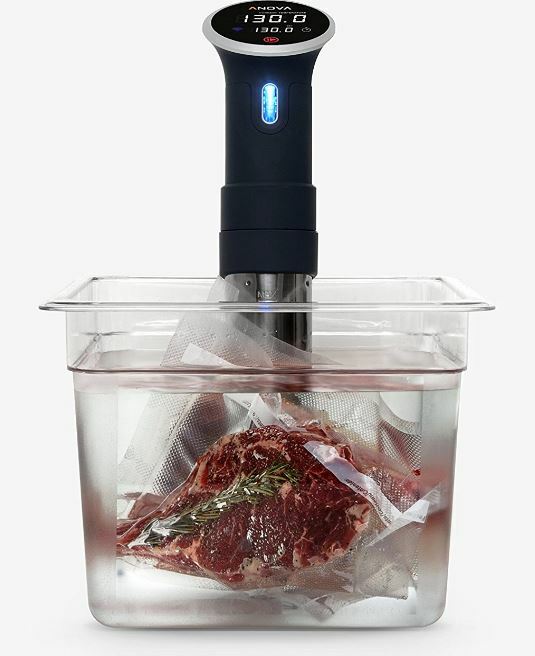 Sous Vide cooking is becoming incredibly popular. You get a perfectly cooked meal every time, retain more of the nutrients, and spend less time above a hot stove. Unless you have a smart model, the learning curve can be pretty steep. In our eyes, there is no better way to learn this unique style of cooking than to follow along with an easy to use app. 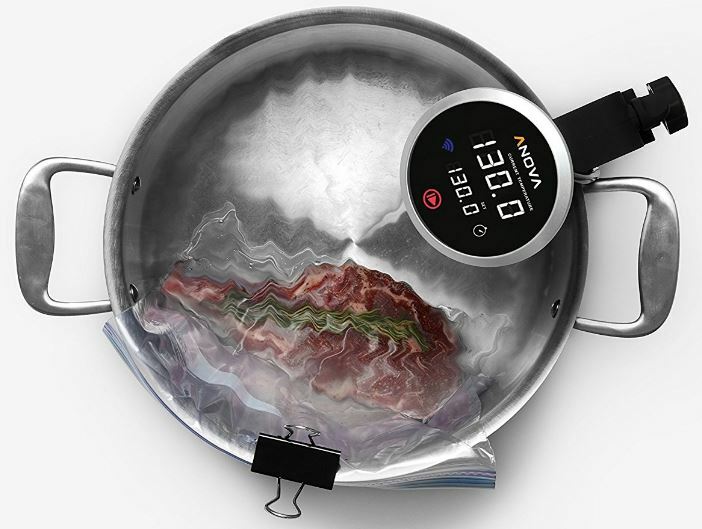 Today, the current cream of the crop is the Anova Sous Vide Precision Cooker with WiFi. It’s powerful, durable, and extremely easy to use. 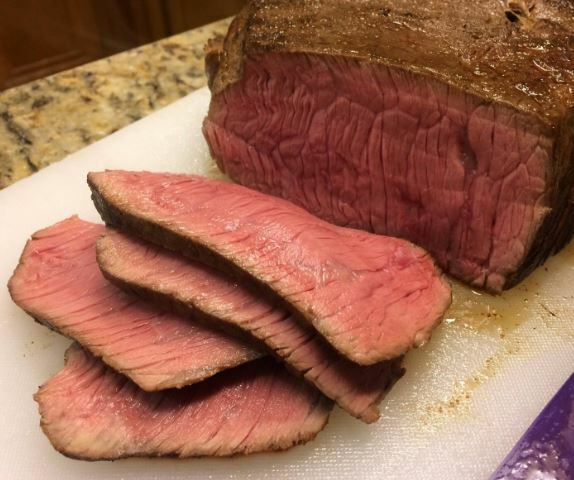 Anova has dominated the industry since launch, and this model shows us why. If you’re not interested in using WiFi, you can save a few dollars by going with the Bluetooth Model, which shares many of the same features. The only disadvantage to the Anova is the fact that it limits you in terms of what pots you can use, and how much water needs to be in the pot. If you’re cooking smaller meals, you might want to consider the ChefSteps CS10001 Joule Sous Vide. This model mounts right inside your pot, and requires only a thin layer of water to work. When you can use a smaller pot, you’ll be able to cook your food much faster. 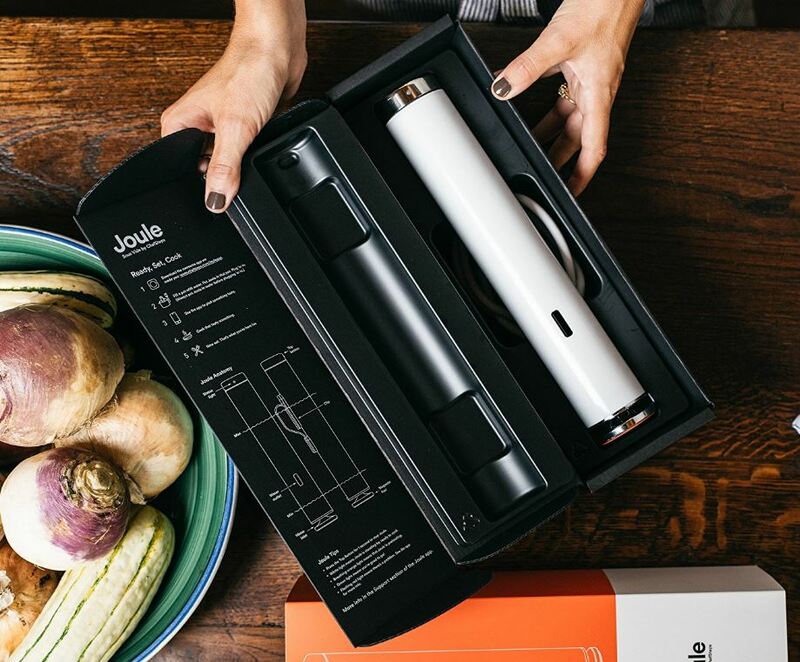 Whether you’re just design conscious or only cooking for one, the Joule is a great choice.